Credit for the first part of our title goes to British author Peter Hitchens describing how little young people knew of his country’s recent past and that most were “dwelling in a void of unknowing.” Great phrasing for a reality we are now seeing all over the world as we wonder with him: “What is it about our past that has led it to be reformed out of existence?” Well, truthfully, I am not wondering as I have repeatedly laid out the desires for transformational change, first in my book, and now on the blog, as the calls just get more urgent. Dovetailing with that UN call for Dignity for All globally by 2030 we saw in the last post turns out to be a Rockefeller-funded report of the Commission on Inclusive Prosperity released https://cdn.americanprogress.org/wp-content/uploads/2015/01/IPC-PDF-full.pdf last month that also includes the related vision for “world-class” education. That IP report would be the sculpted narrative designed to manipulate. Believing in what it asserts requires either being a beneficiary of the vision or being quite ignorant of either history or economics. The usefulness of people not knowing much, while being blissfully ignorant of the acute absence, was really brought home this week as an advocate of Competency-based learning excitedly mentioned that students are told that they “command the helm” of their own learning. I remembered the number of times we have encountered a psychologist or education professor speaking to fellow insiders about creating an internal “keel” within the student’s mind and personality that makes future behavior quite predictable. It seems a bit ironic to brag on one hand about the levels of behavioral control being fostered by Competency and its related “high-quality learning” and then to sell the manipulated student on how autonomous they are. “Dwelling in a void of unknowing” and thus quite ready to be conned while governments steer. Looking for a way to explain the dangers of all this, I went back to a 1958 book called Theory and History by an economist, Ludwig Von Mises, who had the good sense to escape Europe in the mid-30s as Hitler was gaining power. He made the terribly pertinent point that “It is ideas that are responsible for the fact that the interests of people are disparate.” If we use education to control the prevailing ideas and, especially to limit them, it becomes much easier to sell visions of solidarity and the need for wholesale transformation. 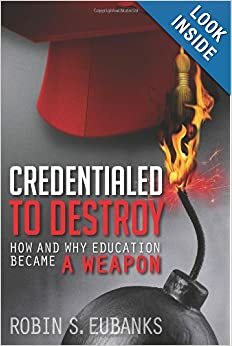 Should we be surprised at all that the year after the publication of that book, American educators and psychologists, whose work would evolve into what we now call Competency-based education, began their global push to take an emphasis on facts, textbooks, and lectures out of the classroom? Whoever controls the prevailing ideas also controls what people will believe their interests to be. Something we all need to be aware of now. In case anyone thinks I am name calling by linking that IP report and Uncle Karl’s vision, the report keeps making statements like “While the economic mission of progressives is unchanging, the means of achievement change from generation to generation as the economy evolves.” That’s darn blunt even before we get to the statement that “we need new social and political institutions to make 21st century capitalism work for the many and not the few.” Anyone else see a problem with a goal that “nations need to ensure both that economic growth takes place and that it is broadly shared”? In order to get widespread acquiescence to that transformative vision education is devoting itself to extinguishing and controlling prevailing ideas. Throughout history, widespread prosperity can either come from plunder a la Ancient Rome (or a pirate ship with a talented crew) or it has to rely on a few hardworking people who have unique ideas–The Vital Few–as a book on the history of entrepreneurship called them. Mind arson and manipulating what people believe makes widespread prosperity impossible. There is a revealing adjective on page 8 of the IP report that really gives away the whole game in the reference to a “managed global economy.” That’s a wish by a few, not a fact, and of course yet another reason to limit prevailing ideas and make education about specified knowledge, broad vocational skills, and lots of social and emotional training to create the desired dispositions. Oh, and since all desired transformations need a good crisis, we get to hear yet again that “employers are increasingly worried about their ability to find skilled labor.” They are more worried about better ideas and service swiping existing customers, but who needs to admit that fact when the skills gap sounds more noble? Plus the advocated alliance of “government, educational institutions, and businesses must work together” actually takes care of the long-term, keeping customers happy, problem. Governments become the real customer and stabilizer of revenue in this vision. The IP report’s authors apparently did not have an adult in their lives when they were children telling them that “wishing will not make it so” because they simply proclaim a desire for “renewing the growth of living standards for everyone.” Well, don’t tell the high-falutin’ members of that IP Commission but Mind Arson makes that plan much harder as does the intention that “children from low-and moderate-income backgrounds need the same opportunities to fully develop their talents that wealthy children have.” Since I do not think the plan is Camps in Maine for All at 12 or Grand Tours of Europe using a voucher, school itself becomes the point of levelling and parents of kids perceived as being wealthy need to recognize they are in the line of fire. Control the excitement. I am sure the world-class schools all come with t-shirts that say “we are all comrades” since “I am a comrade” would basically negate all this solidarity seeking. Finally, “any curriculum must allow for economic and political literacy,” which is more than a little ironic in a report bereft of anything but the aspirational. Now, I know someone out there is saying that the IP report does not mention the Common Core or even competency by name so where’s the link? The report does call for “globally competitive standards developed through consensus, not ideology,” which is kind of funny in a document calling for education for Inclusive Capitalism to finally fulfill the progressive dream. Now I have known for a while that the Common Core is designed to produce the data and desired changes in the students called for by a global program called the Achievement Standards Network (ASN). Financed as usual by Bill & Melinda. Yesterday I was poking around on this site http://www.imsglobal.org/iipe.html where (yesterday at least) we could still find a paper by Rob Abel called “Creating a Shared Vision for Assessment Reform: Building on the Common Core” that stated expressly that the Common Core was created to constitute the US’s participation in ASN and the Dublin Core and Metadata Applications. The ‘globally competitive standards’ then and the ability to get to the Inclusive Prosperity vision are all about the data to be thrown off by digital learning, formative assessments, and “high-quality” learning experiences. If you are like me, none of this vision sounds inviting. No chance whatsoever of it generating broad prosperity, inclusive or not. That’s precisely why we all need to know about these plans now. I personally want to have the discussion of why a plane cannot fly before it takes off, not after it crashes. If none of this is stoppable, no one can accuse me of not trying my best to sound the alarm. I really am not opposed to the 21st Century. I simply notice when I am dealing with a slogan for self-interested change instead of the real rationale. For a long time that has been my suspicion about the Digital Learning push. It would enrich the sellers of all that computer equipment and software. But it’s a lot more than that. I have come a long way since a speech by former West Virginia Governor, Bob Wise, hyping Digital Learning by pulling at the heart strings. He had the audience visualizing the children in isolated Appalachian hamlets hungry for knowledge. Suddenly gaining access to the top science lecturers via ICT and having the chance to move beyond their current circumstances. I remember thinking that I had just read repeated insistences that under the Common Core teaching template lecturing and explaining concepts systematically were out. As in better not do it if you want to keep your job. So the poignant story just came across as a desire to sell Digital Learning where the facts did not fit the sales job. But we have education doctorates now credentialing based on an agreement to make technology the focus of school. It’s central to the accreditation vision of schools and districts going forward. It is central to the UN’s vision of the 21st century “bureaucrats manage us and we don’t complain about it” Knowledge Society. Which is apparently so useful that MIT now has a Human Dynamics Lab looking at a society enabled by Big Data. http://hd.media.mit.edu/ . Something to think about with Peter Senge and Otto Scharmer and reorganizing 21st century society around systems thinking. And the push at Harvard and MIT for Action Science and a new economy based on needs and distributed capitalism. Not to be paranoid but the National Academy of Sciences really did advocate that the US economy be reorganized around Sustainability and planned with Big Data with the aid of the tech companies like Microsoft and IBM. And at the precise same time K-12 and higher ed are being reorganized to limit knowledge and just rain personal behavioral data on companies like Coursera and EdX and NewsCorp’s Amplify and Carnegie and Gates-funded inBloom. What are the odds? I read the new book Big Data this weekend and it states that if another company came up with “an e-commerce site, social network, or search engine that was much better than today’s leaders like Amazon, Google, or Facebook, it would have trouble competing…because so much of the leading firms’ performance is due to the data exhaust they collect from customer interactions and incorporate back into the service.” Now if that is true now, imagine combining that inferential data with all the personal behavioral data scheduled to become available from the new gaming focus of K-12 and the expansion of the MOOCs and the online delivery of basic math and literacy skills. Hillis and Pea both talked about the InBloom K-12 database that will make “open access, flexible, useful learning maps and recommended learning resources for every student’s specific interests and needs–a reality throughout US schools.” Which is of course only possible because of all the personal behavioral data to be captured by the computers and software and Amplify tablets etc. Hillis also mentioned that the Gates Foundation funded the buildout of inBloom’s “personalized learning” infrastructure as part of its much broader interests in education that go far beyond the Common Core. Now the Big Data book says it is now impossible for an individual to limit the flows of Big Data everyday and that we just need to make the companies accountable for what they do with it. But accountable to who? The US federal government wants the tech companies to help governments at all levels rework the nature of the economy. The UN wants the Knowledge Society with a global Mutual Benefit economy that looks like a modern version of that little c communism vision that Uncle Karl came up with so long ago. They claim that will result in a peaceful world by 2030. Transdisciplinarity and Sustainability and MOOCs and Competencies and 21st Century Learning are ALL premised on this revised UN-developed vision of the future. I know because IITE issued an April 2012 Policy Brief that says precisely that called “ICTs for Curriculum Change.” Where is our recourse if that’s the vision the Gates Foundation is actually funding our transformation to? or Carnegie? or the National Science Foundation? And through inBloom and Digital Learning and expanding MOOCs we are about to put Big Data on steroids with info on thoughts and desires and feelings for virtually every student in K-12. Professor Pea pointed out that MOOCs will not be about working with a professor. They will be about students working with each other. An online social learning community throwing off personal data. Community. Community. The omnipresent vision of the 21st century. Will there be any place for the independent individual in this vision?